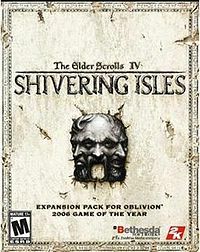 Shivering Isles is the first and only major expansion for Oblivion. Set within Sheogorath's plane of Oblivion, the Daedric Prince seeks a mortal champion to save the realm from the devastating Greymarch, led by the dreaded Forces of Order. Many mysteries await investigation in this twisted, split reality that the Prince of Madness calls the Shivering Isles. This page was last modified on 12 July 2017, at 12:16.